NEW YORK -- Becca visited each of her remaining men's hometowns this week. Her first stop was Manteca, California, where Garrett is from. They were genuinely excited to see each other and they commented on how good they both smell...hmm pheromones anyone? His family owns an agricultural business, or in other words, a farm. So, Becca and Garrett used a planting machine to drop little tomato plants into the ground. 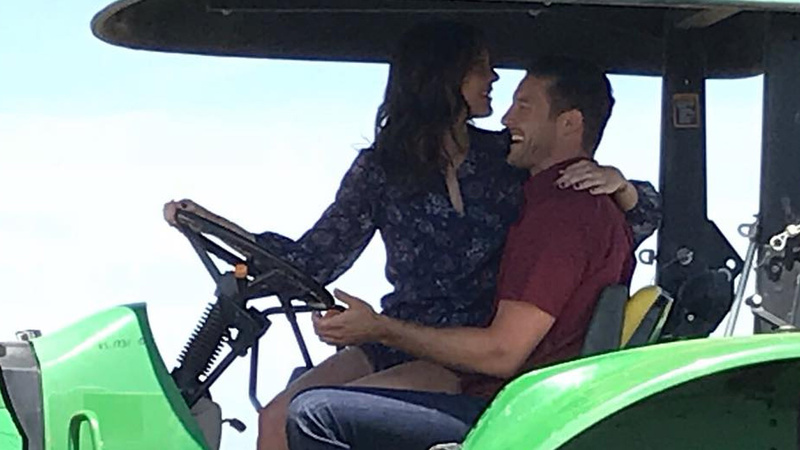 They talked about how they wanted to put their future kids to work on the farm and she commented that he would be a hot dad. They even planted a rosebush together, so he could give her roses straight from the farm, just from him. Becca asked about his history with his ex and he said she would try to keep him from his family when they would only visit once a year. Becca's a bit worried his family will be pretty skeptical of her. That afternoon, Becca stopped by his family's home to meet everyone. He seemed to have a very loving family right off the bat. His mom said that they were really happy everyone could be in town to meet Becca, and of course to see Garrett. Pretty much right as they sat down to dinner, Garrett's sister asked him to talk and he just gushed about Becca. She said that she's excited, but concerned due to his divorce. His dad took Becca aside and told her that he hated seeing Garrett go through heartbreak. His dad begged her to be honest with Garrett about her feelings because he doesn't want him to get hurt again. When it was his mother's turn she told Becca it was awkward when she just couldn't help him when he moved out of his home. She said he was very emotional and asked her if he was making the right decision and she said it wiped her out. His mom is happy to see him enjoying life again and doesn't want to see that go away. It ended on a high note and Garrett told Becca that he's falling in love with her and spent some time passionately kissing her before walking her to her waiting car. Becca said she could really see starting a family with Garrett. She said it feels easy, and right and natural with him. "It all feels like it's falling into place," Becca said. Jason took Becca to Buffalo, New York (my hometown too!). It's where Jason was born and raised although his family no longer lives there. He took her to The Anchor Bar. 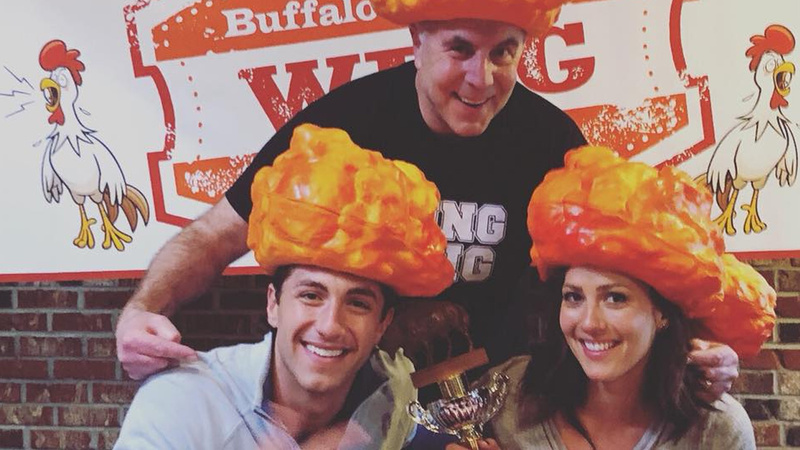 They took part in a wing eating contest with some local customers. They sealed it with a spicy kiss. Then, they went to the newly designed Harborcenter. Jason said that he played hockey throughout high school and he wanted to take Becca skating. He said that she had, "cool hockey mom in her blood." He called her "Beckster" a lot. He showed off his hockey skills and made a goal to win a kiss from Becca. They rode the Zamboni and kissed as some poor dude drove them around the rink. Later that evening, they met Jason's mother, father, brother and brother-in-law. His dad said that he thinks that Jason seems very happy with Becca. His mother asked Becca if she really is ready to get engaged and she says that all she wants is a partner and a family. She asked her if Jason is the one, and Becca said there's still a long way to go but she's very hopeful. That didn't sound as positive as she was with Garrett's family, but we'll see. His mom told Jason that Becca she couldn't read whether or not she loved him or not. She was very honest. Jason said he thinks that Becca cares about him too, so his mom told him to follow his heart. His brother and brother-in-law seem very supportive of him, yet urged him to tell Becca everything he was expressing to them about his feelings for her. Time to put up or shut up. So, just before she left he told her that he always thinks about her and that he's wildly in love with her. As he put her in the car, it started to snow outside. That's the perfect end to a Buffalo visit. It seemed like their relationship took a giant step forward at the end. 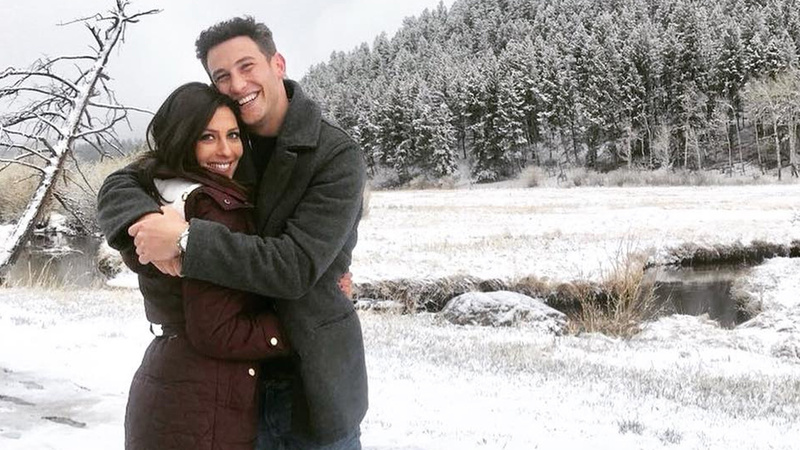 Becca was off to her next hometown visit in Baily, Colorado to visit Blake and his family. The snow was coming down heavily. It looked absolutely beautiful there! Blake took Becca for a tour of his old high school and made out with her in some of the classrooms. He mentioned again how his mother worked there and how she knew all of the teachers. He even introduced her to some of his old teachers. Becca thought it was very sweet. Then Blake talked to her about how they had a school shooting there. His mom got on the intercom and said "code white, code white." The teachers hid the kids and barricaded everyone the best they could. It was a random dude in the woods and unfortunately, he killed one student. It's very sad. This is a very heavy hometown visit. But, then he took her to the school auditorium where the school's students were there to meet her and Betty Who was on the stage was performing. She is one of Becca's favorite singers. They went up on stage and did some risque dancing! Blake and Becca had a great time! That evening, Becca met Blake's mom, step-father, dad, and a bunch of siblings. He sat with his mom and told her he's falling for Becca. She thought it was crazy that he could be engaged so quickly. She believes he's in love, but she's worried that he's going to end up heartbroken. His father also expressed to him that he's concerned about how quickly things are moving. Blake's mom asked Becca what her intentions were and she said that they feel like they are always moving forward. She said that Blake makes her feel hopeful again. Becca learned that Blake had panic attacks and crying bouts after his breakup with his ex. She's really afraid that Blake will get his heart broken again. Becca seems like she's willing to put Blake through it for the possibility of him being the one for her. Blake and Becca shared some very passionate kisses before she took off in her SUV. Finally, it was Colton's turn in Parker, Colorado. He took her to the Children's Hospital where he does a lot of volunteering. They gave the kids some presents and did a really fun painting project with them. He does a lot of work with his own Cystic FIbrosis foundation because of his young cousin. They sat and talked about his lack of dating experience and whether or not he was ready to commit. Becca wants to hear what his family has to say about that topic. Becca met Colton's huge family and was so excited to meet Harper, the girl he created his foundation around. As they sat down to eat, his mother told Colton she's never seen him so happy and perky. He also looks exactly like his father. His dad said that he wanted to make sure that they had a great relationship built on openness. 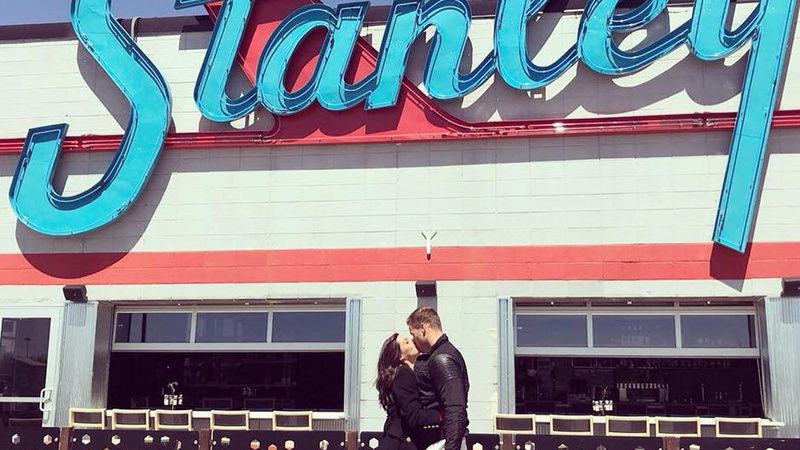 His dad said, while Colton was on one date with Tia, Becca was actually engaged to Arie and he needs to ask tough questions too. His dad asked Becca about the Tia situation and then asked her if she's explained the Arie breakup with Colton. She revealed that Colton hasn't really asked her, but Arie's indecisiveness shouldn't stop her from finding her person. He agreed and said he just doesn't want Becca to pick Colton if he's not right for her. His mom is extremely sweet and very supportive of whatever Colton wants to do. She told Becca that Colton is in love with her and that he's ready to propose to her. Wow! Colton told Becca he loved her again before she left and Becca left knowing that she would have a big decision to make. She had four very successful hometown dates. Then, Becca met up with Bekah, Tia, Caroline, Seinne, and Kendall from Arie's season of "The Bachelor." She recapped her hometown dates for them and even told the five of them that Jason is the best kisser in the world. When she got to Colton, Tia's face changed and she told Becca she wanted to talk to her about her date with Colton. She completely interrupted her. The other ladies were shocked that Tia did that. Tia told Becca that she still has feelings for Colton and it makes her sick to her stomach knowing that Becca is meeting his family and stuff like that. But it doesn't seem like Colton is into her, right? Why is this even a thing? So now Becca is conflicted on if she should continue her relationship with him. Before the rose ceremony, Colton had a heart-to-heart with Chris Harrison on his fears surrounding the fantasy suite. Chris Harrison told him that it's up to him and Becca what goes on in there if he gets chosen, so there's really no pressure. Becca gave her roses to Blake, Jason, and Garrett. That meant that Colton didn't have to worry about the fantasy suite! Ouch. Becca walked Colton out and told him that she just knew that he wasn't the one. Colton gave her a hug and got into the limo. He had a hard time understanding how one of his best days led to him going home. Becca told her final three that she was taking them to Thailand for their fantasy dates. They seem to all go well, so it's going to be a tough decision for her.